We test Toyota’s 2018 RAV4 Adventure and come away impressed. Here’s why. The 2018 Toyota RAV4 is now as old as any mainstream Toyota model ever gets. Going on seven years in the marketplace, the 2018 RAV4 is one of the oldest designs competing for compact crossover shoppers' driveway space. Yet, it is outselling rival Honda’s new CR-V design which is fresh as a daisy. No model this old is perfect, but Toyota’s RAV4 does a lot to draw buyers. We tested an up-market Adventure trim that had both the Cold Weather Package and Power Premium Extra Value Package. After delivery was added, and an unusual “Extra Value Package MSRP Discount” our tester rang in at $33,030. That is about $500 from the top trim of Mazda’s CX-5, but quite a distance from Honda’s CR-V Touring AWD which rings in at a lofty $36,000 even. Here is what we found makes the RAV4 special, and worth considering when the all-new 2019 RAV4 is only 14 days away from being revealed. 2018 Toyota RAV4 Adventure AWD– What Is It? The RAV4 Adventure is a trim that is based on the two-row, compact RAV4’s mid-trim. With cloth seats, one might expect this trim to be down-market, but isn’t. Our tester had a moonroof, power heated seats, heated steering wheel, in-dash navigation, a power tailgate and more. The few items that really make the Adventure trim special include upgrades to the alternator and transmission cooling that allow for towing up to 3,500 pounds. That compared to the 2,000 pounds almost any compact crossover is capable of towing. No trailer hitch or trailer wiring is included in the price. You have to ask a dealer to add it at extra cost. The Adventure also gets about a half-inch more ground clearance to a still pretty mundane 6.5 inches. All-season thick rubber floor mats and a cargo area mat are included (a value of about $350). The RAV4 Adventure drives well and is easy to enjoy on all roads. The four-cylinder engine does a good job of keeping pace with traffic, but the RAV4 does not pretend to be a sports car, which we find refreshing. Handling is good. We liked it more than a recent 2018 Nissan Rogue and Mitsubishi Outlander we tested, but the CR-V and Volkswagen Tiguan are much more refined. Over terrible late-winter New England roads ride comfort was average. The ride is a bit stiff, and the up-sized 18” low profile tires don’t help. Braking is fine, and we would give the RAV4 high marks overall as a family crossover with regard to handling. During our testing, 24 inches of snow fell. We headed out into the worst of it and the RAV4 Adventure was superb. 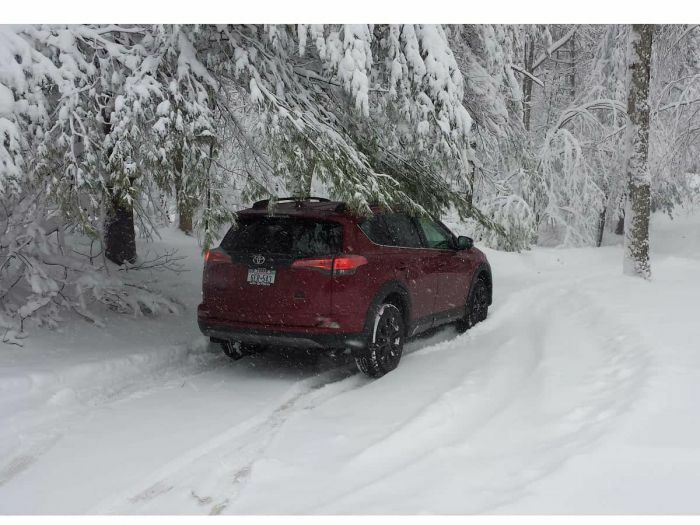 Deep snow, compacted snow, slushy areas, the piled up stuff at the end of the driveway the plows leave – nothing was too tough for the RAV4 Adventure. It was simply amazing. The Bridgestone all-season tires were excellent, but as always, we suggest winter tires for those who live where the white stuff falls. Toyota’s infotainment has an impressive list of capabilities. However, so too does every top-selling brand’s crossover. The in-dash Nav was great. Putting in an address using voice commands was dead simple. Our phone synched easily and we played our music using Bluetooth with ease. The 7-inch screen is average for the segment and entering in commands was pretty easy. Just remember, navigation is found in “apps.” There is no Apple Car Play or Android Auto in any Toyota, so it was not in our 2018 RAV4. We missed it. We much prefer using Google Maps. The RAV4 is a Top Safety Pick by IIHS. However, dig a little into the ratings and the score of Poor on the passenger side small frontal overlap test jumps out at you. Toyota will fix that in 2019, but for now, the RAV4 has a disturbing lack of protection on the passenger side. Unlike some competitors, Toyota offers standard automatic emergency braking and our Adventure had blind spot monitoring, rear cross traffic alert, and lane keeping assist. None of it was annoying. If there is any crossover that can match the RAV4 for overall value we can’t find it. Not only does Toyota throw incentives and discounts at shoppers, the two years of included maintenance is basically free money. We assign a value of about $350 to that feature that Toyota offers and few competitors can match. The RAV4 has earned a 5/5 for predicted reliability from Consumer Reports. That is as good as it gets. Toyota’s most recent ranking on the J.D. Power 3-year Vehicle Dependability Study was above average and topped Mercedes Benz, Audi, Honda, Acura, Nissan, Subaru, and VW. To put it bluntly, Toyota makes the most reliable compact crossover. Consumer Reports even ranks the RAV4 higher than the Lexus RX and NX crossovers. In its last year of production, the 2018 RAV4 remains one of the best compact crossovers money can buy. It is the most reliable, arguably highest-value vehicle in its class. The Poor score on the IIHS test worries us a little, but with standard active safety and so many systems to help a driver out, the RAV4 is a proven safe vehicle. The Adventure trim offers an interesting mix of features for those who want an outdoors theme. This crossover is hard to ignore for those looking for a proven winner in the compact crossover class. Want More? Check out our comparison of the RAV4 Adventure and Mazda CX-5.